How To Win the Big Powerball Drawing!!! There’s only about a dozen hours left to buy Powerball lottery tickets before the big drawing Wednesday evening. As I write this, the estimated jackpot prize is $1.4 billion dollars, making it the largest jackpot in the history of the game. And because I love my readers so much, I’m going to tell you how to win the Powerball jackpot! 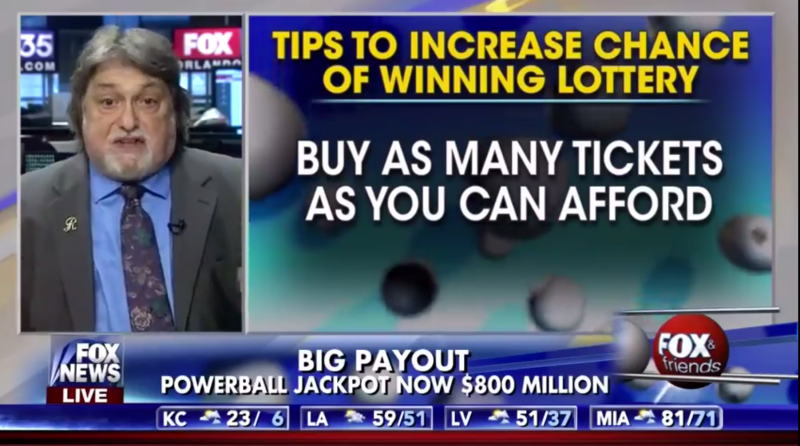 I’m also going to tell you how to make the most possible money playing the Powerball lottery, which, it turns out, is not the same thing. I’ll even have a few thoughts on picking numbers. Set a “lottery budget” each month and use it to buy multiple tickets for the same game. Do not use the “quick pick.” Select random numbers for better odds. Play the same numbers every week. Play numbers that haven’t been part of a winning combination in a long time. Of these suggestions, #1 has no effect on the game, but may help you avoid spending too much. #3 makes no difference, #2 and #4 will reduce how much you earn, and I think so will #6. And Lustig’s #5 tip is the worst idea in the world. Technically, Richard Lustig’s advice as shown in this image is correct. The key is the phrase “increase chance” of winning. The math is straightforward: A Powerball drawing can result in one of 292,201,338 possible number combinations, and you win if you own a ticket with that number. So if you own 1 ticket, your odds of winning are 1 in 292,201,338. If you own 2 tickets with unique number combinations, your odds of winning are 2 in 292,201,338. And so on. The more unique tickets you buy, the more chances you have to win. So if you want to win the jackpot, buy a lot of tickets to get the best odds you can afford. As you buy more and more uniquely numbered tickets, your odds of winning increase linearly all the way up until you buy 292,201,338 tickets with unique number combinations — one for every possible number combination in the game — at which point the Powerball drawing must choose a number combination on one of your tickets. See? I told you I’d tell you how to win the Powerball jackpot: Just buy all possible tickets! Ah, but if the prize is $1.4 billion, as it is now, wouldn’t you make a net profit of over $800 million? Doesn’t that mean that buying a lottery ticket actually makes sense? Aren’t you guaranteed to make money if you do this? As you can probably guess, it does not. There are three reasons for this. The first is that the Powerball lottery is run by the state governments, and they allow themselves to lie to their customers in ways no one else can. The main Powerball jackpot number always the sum of the amount paid out in a series of 30 annual payouts. If they say it’s a $300 million jackpot, that means $10 million a year for 30 years. If you take it all in a lump sum, you get a lot less (but you get it all now). I’m pretty sure that no ordinary financial investment or gambling operation would be able to get away with misleading customers like this. The current Powerball jackpot prize pool is estimated to be $868 million, so if you win it all, you can have that amount right away. (Unless your state is run by morons.) Or you can choose to let the state keep the money for you, in which case they will invest it in an annuity that will pay you about $46.7 million per year for 30 years, for a total of $1.4 billion. You could do the same thing yourself with the lump sum if you could find a way to invest the money that earns 3.7% interest, which is only slightly better than the current prime rate. The second reason you aren’t guaranteed to make money buying all 292,201,338 possible lottery tickets is because of income taxes. The top bracket of 39.6% kicks in at just under half a million, so if you won the $868 million prize pot, you’d pay $344 million in taxes and get to keep about $524 million. Since it cost you $584 million to buy all the tickets, you’d have a net loss of $60 million. If you were professional gambler, you might be able to argue that the $584 million cost of the tickets was a legitimate business expense, so you’d only pay taxes on your net profit of $283.5 million, allowing you to keep about $171 million of the total. Not bad, right? Too bad you don’t actually have $584 million to spend on lottery tickets. When you only purchase a fraction of the 292,201,338 possible tickets, you have to think in terms of something called expected value, which is the value of the jackpot prize multiplied by the probability of your actually winning it. So if you buy only 50% of all possible tickets (146,100,669) then you only have a 50% chance of winning, so the expected value of your winnings is half the lump sum payout, or $434 million. If you buy only one ticket, the expected value is 1/292,201,338 of the lump sum payout, which works out to $2.97. Since a ticket only costs $2.00, your expected pre-tax earnings are 97 cents for every ticket you buy. You’ll have to pay taxes, of course, and since your expense is only $2, you owe taxes on the entire prize, leaving you with $524 million as described above, so the expected value of a ticket is $524,000,000/292,201,338 = $1.79. That’s the second answer I promised you: Since every ticket you buy gives you an expected loss of 21 cents, the way to make the most money playing the Powerball lottery is to minimize your losses by purchasing exactly zero tickets. You cannot lose if you do not play. The good news is that the expected value of each ticket depends on the odds of winning the jackpot, which never change, and the amount of the prize pool, which is creeping up. By my calculations, when the jackpot hits about $968 million you will get to keep just enough after taxes (assuming you live in a state that doesn’t have income tax) to cover the cost of buying all 292,201,338 possible tickets, which means the expected value of a $2 ticket will be 2 dollars, so buying tickets won’t lose you money. The third reason it’s hard to make money on Powerball is that the grand prize is awarded on a parimutuel basis. That means the prize pool is split among all the jackpot winners. If two people have winning tickets, each one gets only half the prize pool. That’s normally pretty unlikely in Powerball, but when the prize gets very big, a lot of people buy tickets, and that increases the probability that more than one person will pick the winning number combination. The previous Powerball drawing had a lump sum jackpot of $950 million, and the next one is estimated to be about $500 million higher. Since the jackpot gets about 32.5% of the ticket income, that means the Powerball people are expecting to sell $1.5 billion worth of tickets. At $2 a piece, it means that about 750 million tickets will be sold. Since there are only 292 million number combinations, there’s a pretty good chance that two or maybe three people will win, and that will reduce the expected value of a ticket below the $2 purchase price, making the expected value a losing proposition. Ethan Wolff-Mann at Time estimates the break-even for the next drawing is at about $1.5 billion lump sum, or about $2.6 billion annuity payout, when adjusted for the probability of multiple winners. Anything less than that leaves you with an expected loss. Now that I’ve thoroughly destroyed the value proposition of the Powerball lottery, are you still trying to come up with an excuse to buy a ticket? Well let me see if I can help by pointing out a couple of twists in my analysis. First, it’s not clear that the mathematical expectation (amount won multiplied by the probability of winning) is the correct measure for a lottery player. It depends on your attitude toward risk. If I offered you either $100,000 or a 50/50 chance of winning $200,000, which would you choose? Since both choices have the same expected value ($100,000) most people will probably prefer the choice with less uncertainty and take the flat $100,000 award. But some people will choose to gamble. They have a greater tolerance for risk, and there’s no compelling way to say how much risk tolerance is the correct amount. Among other things, it depends on your situation. If you need $200,000 to start a business and $100,000 won’t be enough, then you might take a chance on $200,000-or-bust to try to start your business. If you’ll die next week without a life-saving medical procedure that costs $200,000 then the certain $100,000 award is worthless to you. So maybe it makes sense in your personal analysis to risk the almost certain loss of $2 in order to have a really small but non-zero chance of retiring early and living happily ever after. The second problem with my analysis is that I’m only counting the financial benefits of playing Powerball. There can be other benefits, such as the fun of knowing that for at least a little while there’s a very real (but very small) chance you could win big. Really big. If that fantasy becomes the most important thing in your life, you may have a gambling problem, but otherwise there’s nothing wrong with buying a ticket just for the fun of it. It’s certainly no worse than other ways we spend money to entertain ourselves, such as going to concerts, riding roller coasters, or sitting in the bleachers at Wrigley watching the Cubs lose. So now that you’ve decided to play anyway, what numbers should you pick? Richard Lustig advised picking numbers that haven’t been winners in a long time, but that’s a classic fallacy: The balls have no memory. There’s no way for them to know that they’re “due” to win. Each lottery drawing is independent, and what happened in past drawings has no effect on what happens in the next drawing. Mathematically-inclined people will also tell you that the drawing of numbers is completely random, so it doesn’t matter which numbers you pick. Both parts of that statement are wrong. The numbers drawn are not completely random, and it does matter which ones you pick. The numbers aren’t completely random because they are produced by an imperfect mechanical system. The “identical” balls almost certainly aren’t. Not perfectly. Variations in the process that produces them will cause variations in properties like size, weight, roundness, weight distribution, and surface friction, and those variations will make some balls slightly more likely to be drawn than others. The effect will be small — otherwise it would be quickly detected and the ball set would be replaced — but it will be there, and it might show up in the history of the drawings. A similar trick can work in casinos that are too cheap to replace expensive equipment like roulette wheels. Alert gamblers could spot when numbers start coming up non-randomly and change their bets to try to beat the house. You probably can’t do that with Powerball because the variations are too small and the lottery has a much bigger house edge than most casino games, but couldn’t you at least limit your losses a teeny bit by betting on the numbers most likely to come up? Probably not. This version of Powerball has been going on for a few months, and over that period the four most common numbers drawn are 35, 25, 29, and 20, with the fifth most common number being a tie between 11, 31, 45, 49, and 51. The most common “powerball” number is a tie between 7 and 15. These anomalies appear in the data because either (a) there’s something special about those balls, or (b) it’s random chance. If there’s something special going on — if the balls are defective or rigged — then betting those numbers could slightly improve your chances of winning. But it it’s all just random fluctuations, then your chance of winning is unaffected by the numbers you pick, so betting the most common winning numbers can’t possibly hurt. It sounds like win-win. Except that the lottery jackpot is perimutuel, and thousands of people have read the same statistics I just used. If a hundred of them decide to pick those numbers (a single $20 bill covers all 10 combinations), you could end up splitting the jackpot with all of them. The disadvantage of splitting the purse overwhelms any statistical advantage to picking the most likely numbers. In fact, the effects of the perimutuel system are the most important factor in choosing lottery numbers, and they are the only factor you can control. Slight variations in the lottery balls notwithstanding, the numbers drawn in the lottery are random, but the numbers that lottery players pick for their tickets are not. Humans are terrible at picking random numbers. No matter how hard we try, we fall into patterns and choose collections of numbers that badly fail the statistical tests for randomness. And a lot of people don’t even try. They reason, correctly, that all numbers have (very nearly) the same chance of winning, so they pick numbers from birth dates, address, and telephone numbers. Those numbers follow patterns — months less than 13, days less than 32 — that skew their distribution, causing ticket buyers to collectively cluster around some numbers and avoid others. I don’t know which numbers people pick and which they avoid, but I can think of at lease one way for you to find out: Go around to as many different lottery sales locations as you can, and start collecting discarded tickets from the trash. It doesn’t matter that they’re all losers. Your purpose is not to learn which numbers win, it’s to learn which numbers people pick. Go to as many different kinds of ticket places as you can, in as many parts of the country as you can. You probably need several thousand tickets to get a good statistical sample, and since about 70-80% of tickets sold are random Quick Picks generated by lottery computers, you’ll have to sift through a lot more to find the ones you need. I think Quick Picks are marked “QP,” but that may not be the case everywhere. If you can’t tell quick picks from hand-selected numbers, then you need even more tickets in your sample to overcome the random statistical noise of the computer’s choices. I’d aim for 10,000 tickets. Once you’ve got your tickets, tally up how often people pick each number. Find numbers that everyone else is picking the least, and buy your tickets using combinations of those numbers. The lottery is still (very nearly) random, so you won’t be any more likely to win, but if you do win, you’ll be less likely to have to share it with someone else. Unless, of course, other people are doing the same research on discarded tickets that you did, in which case you will both be picking tickets from the same pool of least-used numbers, which increases the likelihood of picking the same winning number and having to share the prize. Or you could just buy a Quick Pick. It’s a lot more random than if you picked the numbers yourself, so there’s less chance of you and a bunch of other people clustering around a shared group of numbers that force you to split the jackpot, and it’s a lot less work than going through the trash. Play the fewest tickets you can, ideally none. (At least while the jackpot is below $2.6 billion). Play numbers that are less likely to be played by other people.